October days not only lifted our hearts with beautiful Autumn weather, but also brought some wonderful books our way. Three books stand out in my mind as the three year old favored them the most for weeks, urging me to share them here. These three books from the 3 year old also happens to appeal very much to the resident 6 year old. And to all ages, as a matter of fact. The clever message, crisp story and humorous illustrations made these my favorite read-aloud books. I think it is the comical colorful illustrations that appealed the most. Calvin is a brand new baby starling hatched along with his siblings and cousins. While the others discover worms and dirt and water, Calvin discovers books. While others dream about eating bugs, Calvin dreams about adventure stories and poetry. While others learn to fly (with their teacher Mr.Wingstead), Calvin is busy in the library (which is inside the trunk of a large tree, with posted Hours and Nocturnal Hours by the arched doorway). 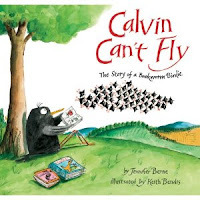 Finally, when it is time to migrate, Calvin hasn't quite mastered the art of flying, owing to lack of practical knowledge although he is brimming with theoretical details. His cousins end up towing him much to his embarrassment. However, the message in fact turns out to be quite a (wild yet) positive one. Calvin, thanks to his bookish knowledge, manages to steer his whole migrating flock of fellow starlings away from danger. And they thank him profusely and throw a party in his honor. Calvin's cousins call him names: "nerdy birdie", "geeky beaky", "bookworm". When you are a bird being called a "worm" is a very bad thing. "We don't do name-calling, that's not okay. Calvin's cousins are mean to him." chimes in the 3 year old every time we read this page. Another message registered. And the heartwarming part is at the end when Calvin can actually fly! He never tried it before and therefore never knew he could do it. But once he tried it and practised hard, he flew just as well as the others who continued their journey of migration. I ended up loving this book as much as (if not more than) the three year old. A charming little book by one of my favorite authors. Her Cookies book was Ana's favorite a few years ago, still picked up from our bookshelves on and off. It amazes me to see Ms.Rosenthal do it over and over again: take a simple route to present a profoundly beautiful message without sermonizing, always gentle and tender, woven with humor and wit. 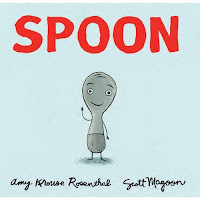 The message again is quite subtly yet clearly conveyed: Spoon is not satisfied with who he is. He longs to be like others. He sees them as having more fun. Knife gets to cut and spread. Fork gets to go practically everywhere. Everyone thinks chopsticks are cool and exotic. Meanwhile, unbeknownst to Spoon, his friends rather envy him. Knife says, "No one is allowed to be silly with me." Fork is impressed as Spoon is used to measure out stuff. Nobody uses Fork to measure stuff. Well, you get the idea. 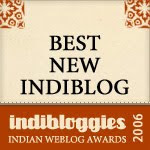 The book celebrates the individual and their unique traits that make them who they are, at the same time lets us see the flip-side of everything. Spoon finally sees his own merits when his mom reminds him of all the things he can do. So, finally Spoon feels alive again, rather than mope around thinking of all the things he cannot do. 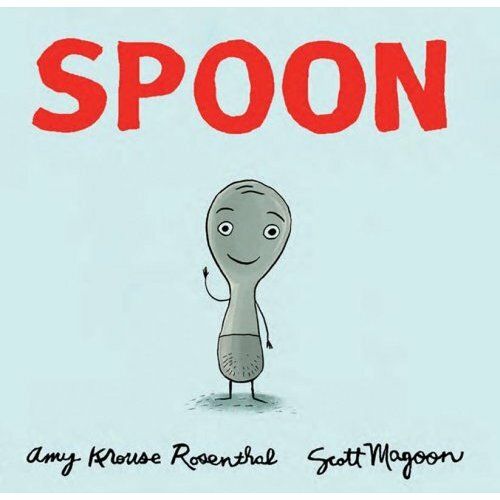 Some of the tongue-in-cheek wordplay in this book is probably lost on the 3 year old, who takes it at face value and laughs at the pictures and yet gets the message about why Spoon is special in his own way. A brilliant book for all ages. The illustrations are funny and witty, with dark black line and greyish silvery look. The page with Fork having all the fun digging into a slice of cake, standing up with a forkful of salad, and esp., ready to delve into the pie was the kids' favorite. I liked the Spoon family photo where the spork is the black-sheep, rather a misfit. Would they welcome him in the Fork Family photo? Bilingual books are fun. So are books with CD for read-along. Mañana, Iguana has both these features making it a recent favorite with all of us. We learnt the days of the week in Spanish, as well as Yo Si (I will) and Yo No (Not I) thanks to conejo and culebra and tortuga. Much like the classic folk tale The Little Red Hen, the story covers friendship, teamwork and not the least, contribute if you want the benefit of the labor. On Monday (lunes), Iguana decides to throw a party for her friends the following Saturday (sabado). There are party invitations to be written and delivered, food to be prepared, decorarions to be hung. 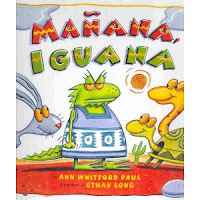 Iguana asks her friends conejo (rabbit), culebra (snake) and tortuga (tortoise) for help every day. Predictably, they each have an excuse for every task. Rather than help out now, they say, "Mañana, Iguana" and while away their time. Well, the rest of the story is apparent: the friends get a rude shock when they try to gate-crash Iguana's party, not being invited and not having helped host it. All's well that ends well. They realize the error of their ways and come through in the end. 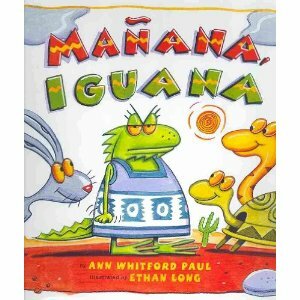 The illustrations are vibrant with the Southwest landscape, complementing the story well, revealing Iguana's feelings at every turn. The repetitive response when Iguana solicits help and the distinct characteristics of the animals makes this a wonderful read-aloud book. The timelessness of this story and the Spanish-learning opportunity appealed the most to me. Thanks for sharing these books.My kid is avid reader(he is 4) and i have to keep finding new books for him.